RUDI SKACEL’S phenomenal hat-trick helped ten-man Hearts accelerate to third place in the Scottish Premier League as St Mirren were totally overwhelmed in an enthralling game at Tynecastle. Marius Zaliukas was dismissed after scoring the opening goal and the visitors quickly built a 2-1 advantage through Paul McGowan’s penalty and Steven Thompson’s header. Then Skacel took over with three stunning efforts, all struck from more than 20 yards, before John Sutton completed the scoring in the final minute. Hearts’ players displayed unquenchable spirit to recover from Zaliukas’ red card and the 2-1 deficit. Once in front, they became rampant. Hearts opened the scoring after only 51 seconds of play. Ian Black’s corner arrived for the onrushing Zaliukas to head powerfully beyond Craig Samson. St Mirren’s marking was utterly atrocious but that was of little concern to the buoyant home side. Zaliukas went from hero to villain inside 11 minutes by conceding a penalty and earning an instant red card for denying McGowan a clear goalscoring opportunity. McGowan calmly drove the penalty high to Marian Kello’s left to level the scores – then was booked for some inflammatory celebrations. 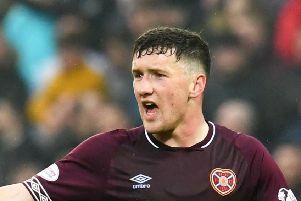 Facing a numerical disadvantage, Hearts looked disjointed and fell behind in the 18th minute when Thompson sprung high above the Pole to nod a looping header over Kello and into the net. The game continued in frantic fashion when Hearts restored parity through Skacel’s first. The Czech dispossessed Graham Carey to dispatch a ferocious shot high into the St Mirren net from 25 yards. Little changed in the second half, although it should be noted that both teams played plenty fluent, attractive football throughout this encounter. The ten men of Hearts showed their relentless work ethic to defend and attack in numbers and Stephen Elliott shot high from a central position on 54 minutes. Kello then beat Carey’s drive away to prevent a certain goal. Just as it seemed they might be starting to tire, Hearts produced another goal. Or, more accurately, Skacel did. Sutton laid Jamie Hamill’s throw back to the Czech, again more than 20 yards out, for another trademark left-footed drive which angled away from Samson and nestled in the corner. The decibel level rose another notch four minutes later when the irrepressible midfielder completed his hat-trick. Skacel evaded the persistent David Barron and, with another 20-odd yarder, slotted his finish out of Samson’s reach. There was still time for a fifth from Sutton, who converted a free-kick laid into his path by Black’s after Samson picked up Tesselaar’s backpass. But by then there was little doubt over the destination of the three points. Hearts: Kello; Hamill, Webster, Zaliukas, Barr; Robinison, Mrowiec, Black; Skacel; Sutton, Elliott.